NEXT MEETING - Click here to read next meeting agenda scheduled for 1/16/2019. CALL TO ORDER - Chair Sharon Schneider called the meeting to order at 7:02 p.m. A quorum was established with seven (7) members present. Note: This 11-member Board requires six (6) members to establish a quorum and to take official Board action. Board Members Present - Mark Hagadone, Calvin Hara, Sharon Schneider, Marilyn Moniz, Lori Yamada, Brian Kang, and Nicole Evans. Board Members Absent ??? Becky Gardner, Paul Hoe, and Molly Pierce. Guests - Lieutenant Christopher Lowell (Honolulu Police Department); Captain Ricky Mamiya (Honolulu Fire Department); Ann Wong (Board of Water Supply); James Larson (Councilmember Ann Kobayashi's Office); Karen Yorimoto (Councilmember Trevor Ozawa's Office); Senator Les Ihara Jr.; Ian Terayama (Senator Stanley Chang's Office); Representative Calvin Say; Representative Bertrand Kobayashi; Bryan Kimura (Hawaii Department of Transportation); Eric McCutcheon, Carol Hoshiko, Roland Louie, Sarah Chinen, and Tom Moore (Residents); Harry Cho (Neighborhood Commission Office). • October 2018 Statistics: There was 1 structure fire, 1 nuisance fire, 10 activated alarms, 76 medical emergencies, 1 motor vehicle collision with a pedestrian, 3 motor vehicle crash/collisions, 2 mountain rescues, and 1 hazardous material incident. • Safety Tip - Cooking Safety: Cook with caution. If you are sleepy or have consumed alcohol, do not use the stove or stovetop. Stay in the kitchen when cooking. Keep anything that can catch fire, including oven mitts, wooden utensils, food packaging, and towels away from your stovetop. Keep children at least three (3) feet away from the stove. If you have a small grease cooking fire, smother the flames by sliding a lid over the pan and turning off the burner. Leave the pan covered until it is completely cooled. For an oven fire, turn off the heat and keep the door closed. If you have doubt about extinguishing a small fire, get out of the house and call 911. When leaving, close the door behind you to help contain the fire. With the upcoming Thanksgiving Day holiday, HFD discourages the use of turkey fryers. Turkey fryer usage can lead to devastating burns and injuries and destroy property due to the large amount and high temperature of oil. • October 2018 Statistics: There were 6 motor vehicle thefts, 28 burglaries, 31 thefts, 12 unauthorized entry of motor vehicles (UEMV) and 6,607 total calls for service. • Safety Tip - Home Security: A handout was distributed to the public and Board. 1. Thefts: A community member raised concerns with the increase in thefts. Lieutenant Lowell stated that these minor fluctuations are common. HPD does their best to maintain and minimize crime. 2. Total Calls: Hara asked why total calls for service are so high on the monthly report. Lieutenant Lowell stated that the total calls for service is the statistics from Punahou to Sandy Beach. • October 2018 Main Breaks: There were no main breaks in October 2018. • General Water Announcements: Be wary of scam calls or visits. The BWS is reminding its customers to be wary of potential scams involving fraudulent phone calls or visits from people claiming to represent the water agency, stating the account is overdue, demanding immediate payment. This warning comes as scammers have approached customers using these tactics. Anyone who receives unexpected and or aggressive phone calls demanding payment for a past due bill are encouraged to call the BWS for verification. Do not give any information to the caller. Here are a few tips to help protect yourself from scams that may use water bills as a lure: Know your account status. Call BWS customer service staff at 748-5030 or sign up for online billing services for accurate information about your account. Understand BWS collection procedures. BWS does not call customers outside its business hours Monday through Friday, 7:45 a.m. to 4:30 p.m., to request for payment. BWS does not call customers, demand payment, and collect payment all in the same phone call. If a customer is contacted for overdue payment, he or she will be asked to call 748-5030 to make a credit card payment. Safeguard your personal information. Never give your credit or debit card number or personal information to any caller or visitor without knowing their true identity. 1. Workshops: Hagadone asked if BWS still offers public workshops. Wong stated they do and the schedules are available online. 2. Sierra Drive: Schneider asked if Sierra Drive will be repaved since work has been completed. Wong stated that it should be repaved. However, will follow up at the next meeting. 3. Sidewalks: A community member raised concerns with damaged sidewalks along Elizabeth Street/Keanu Street. • Diamond Head Tunnel: A community member raised concerns with the lack of lighting in the Diamond Head Tunnel. He stated that there are multiple lights that are not illuminated and have been multiple injuries that have occurred in the tunnel as well. • Pedestrian Safety: A community member raised concerns with the lack of traffic lights at the crosswalks along Waialae Avenue from Home Street Bank to Bank of Hawaii. There are only two (2) crosswalks with traffic lights out of the seven (7) crosswalks. That segment of Waialae Avenue is on the top of a hill. Cars traveling east or west need to accelerate and may not see or stop in time for the pedestrians using crosswalks without traffic lights. It was suggested that the crosswalks be painted yellow or install reflective materials in crosswalks without traffic lights. Hagadone suggested using the Honolulu 311 app which has been very effective. • Christmas Lights: A community member asked what the status of the Christmas tree lights at Puu O Kaimuki Mini Park is. They asked if the City is allowing it to be set up, and if so, when will it be put up and taken down. Hara gave an update on the permitting process. Moniz voiced her support for the Christmas tree lights. Hagadone suggested forming a permitted interaction group (PIG). Merge from Kokohead Off-Ramp by Hawaii Department of Transportation (HDOT) - Bryan Kimura gave an update on the existing conditions of the Kokohead Avenue off-ramp. The proposed alternative would reconfigure the off-ramp and reconfigure the intersection of Kokohead Avenue and Harding Avenue. The alternative would widen the off-ramp and add a right turn lane. 1. Lights: Schneider suggested changing the sequence of the lights to reduce traffic. 2. Piikoi On-Ramp: Kang asked if the Piikoi on-ramp project will be made permanent. Kimura stated that they are in their second pilot and will conduct another evaluation. • Land Use Ordinance (LUO) Project Status: The City's zoning code, LUO, has not been updated in a comprehensive manner since 1986. While it has been incrementally amended over the years, some would suggest that this fragmented approach has created a document that has become difficult to understand and use. Last year, the City Council agreed that the LUO should be updated. The Council allocated some funds to begin the outreach effort. The City hired a consultant to begin collecting recommendations for the code's improvement. The consultants have already begun speaking with property owners and land use organizations (comprised of architects, planners, builders, environmental advocates, affordable housing advocates, and the like). We should have an initial list of recommendations by the end of this year. Outreach will continue throughout this project and plans are underway to get input from the Neighborhood Boards. In June of 2018, the City Council approved a budget that included funds to begin drafting code amendments. We plan on beginning by updating the definitions in Article 10. Once the revisions are ready, they will need to be first reviewed by the Planning Commission during a public hearing. The Planning Commission will forward their recommendations to the City Council, where there will be numerous additional opportunities to provide input. ??? Neighborhood Board Elections: Beginning Monday, December 3, 2018 through Friday, February 15, 2019, residents across Oahu may register to become a candidate in the 2019 Neighborhood Board Election. The Neighborhood Board System was established in 1973 by former Mayor Frank F. Fasi as a way to spur civic participation and engage with city government. Currently, there are 33 Neighborhood Boards across Oahu, which are comprised of 437 elected volunteer board members. Any Oahu resident who is 18 years of age can become a candidate. The Neighborhood Board Election will be held online from April 26, 2019 through May 17, 2019. Text "GoNCO" to 95577 to receive mobile text alerts related to the 2019 Neighborhood Board Election. Please note that standard message and data rates may apply. For more information call 768-3705 or visit www.honolulu.gov/nco. o Kaimuki Municipal Parking Lot: Department of Design and Construction (DDC) stated that the design of the Kaimuki Municipal Parking Lot #2 Improvements Project is in progress. A presentation of the project will be made to the Board on a date to be determined once the design plans are more developed. This is expected to take several months. o Monster Homes: Department of Planning and Permitting (DPP) stated that on Tuesday, October 30, 2018, an investigation by the DPP revealed Building Permit No. 821656 was issued for a new two (2) story two (2) family detached dwelling with a wet bar and a new 6'-0" Concrete Masonry Unit retaining wall. The building permit classified the structure as an R-3 occupancy, which denotes the structure to contain no more than two (2) dwelling units. This is a classification under the International Building Code. In contrast, R-5 is a zoning classification under Chapter 21, Revised Ordinance of Honolulu (ROH). This two (2) family detached dwelling (two (2) units) was approved to be constructed on the 7,500 square foot parcel. The residential development standards of the LUO permits a two (2) family detached dwelling on this lot. The building permit application was submitted before the implementation of Ordinance 18-6 (which became effective on March 13, 2018), therefore, is not subject to the restrictions of Ordinance 18-6, creating limits on large residential homes. The DPP will continue to monitor this project until completion. • City Park Pool Schedule Shifting: The Department of Parks and Recreation (DPR) recently announced that they will be adjusting the pool schedules for heated water at various city parks. This will affect the heating schedules for pools at Palolo Valley, Manoa Valley, and Makiki District Parks. Due to input from pool users and temperatures remaining warm later in the year, DPR staff determined that heating the pools later by one (1) month, would provide more benefits to pool users. Beginning this year, the four (4) month heating schedule will begin in December. For more information please visit www.parks.honolulu.gov or contact the Department at 808-768-3046. • Vision Zero Resolution Update: Due to the significant number of traffic related fatalities and accidents, Councilmember Kobayashi introduced Resolution 18-219 last month, which requests the administration to adopt the goals, strategies and policies of the Vision Zero Network. Vision Zero is a comprehensive strategy to eliminate all traffic deaths and severe injuries by reviewing traffic patterns, speed limits, and high incidence locations and implementing a plan to address these high-incident areas. The Resolution was recently considered and discussed in the Committee on Transportation and passed out for adoption. The Resolution is expected to be heard by the full Council for adoption on Wednesday, November 14, 2018. • Resolution 18-223: A resolution (Resolution 18-223) requesting the City Auditor to conduct an audit of the Department of Planning and Permitting's inspection processes for "Monster Homes??? was reported out of the Budget Committee on Wednesday, October 17, 2018 for adoption. Resolution 18-208 was adopted, establishing a permitted interaction group (PIG) of Councilmembers to investigate matters relating to the delays in the permitting process at the DPP. Councilmember Ozawa was designated as one (1) of the Councilmembers on the permitted interaction group. • Resolution 18-212: Resolution 18-212 urging the Director of DPP to serve an order to demolish the unpermitted structure on Date Street, was heard in the Zoning and Housing Committee. It was learned that the structure is no longer un-permitted and that accumulated fines are in the five (5) figure area. Councilmember Ozawa was also informed that in the past, negotiations of accumulated fines were blanketed and now they are taken on the merit of each situation. Councilmember Ozawa would prefer limiting or capping the percentage that a fine can be negotiated down to deter this type of activity. Senator Stanley Chang - Ian Terayama reported the following: Water Main Breaks: Major water main breaks along Kalanianaole Highway have plagued the residents and commuters of East Honolulu for the last two (2) years. These main breaks have caused many residents to be without running water and resulted in insignificant traffic congestion along the highway. This past legislative session, Senator Chang introduced SCR3/SR2, which requests the Office of the City Auditor to conduct a performance audit of the BWS's maintenance program on traffic mitigation measures. Unfortunately, the resolutions were not passed, but will be re-introduced in the upcoming session. Questions, comments, and concerns followed - Monster Homes: A community member requested for Senator Chang to re-introduce a Bill on monster homes. • Opening Day: The third Wednesday, January 16, 2019 will be the opening day for this year's legislative session. The public is invited to join at the Capitol. • Real Estate Investment Trust Bill: Senator Ihara will be looking into this Bill. • New Representatives: The State House of Representatives welcomed nine (9) newly elected Representatives to the 2019 Legislature. They are a very diverse and energetic group comprising of educators, business people, and attorneys. Three (3) represent neighbor islands. The new State Representatives include six (6) women and three (3) men, the first time in Hawaii history to have more newly elected women than men. • Diamond Head Homeless Sweep Update: Mr. Jason Redulla, Deputy Enforcement Chief, Department of Land and Natural Resources (DLNR), Division of Conservation and Resources Enforcement (DOCARE) gave the following update regarding the recent DOCARE enforcement sweep of homeless individuals from Diamond Head State Monument. This is for the period of September 2018 to November 2018. There were 34 people contacted, six (6) campsites on the Fort Ruger side of Diamond Head were located, 19 campsites were located on the Makai slopes of Diamond Head, 26 citations were issued for camping violations or being present in a closed area, and on Saturday, November 10, 2018, 10 additional citations were issued. Mr. Redulla has advised that weekly checks are being conducted along the slopes of Diamond Head State Monument. Discussion on Board Seats - Yamada moved and Kang seconded to keep the Board seats as is. The motion was adopted by Unanimous Consent, 7-0-0. (AYE: Hagadone, Hara, Moniz, Schneider, Yamada, Kang, and Evans; NAY: None; ABSTAIN: None). Formation of Permitted interaction Group (PIG) to help support Kaimuki as an Age Friendly Community - Hara moved and Hagadone seconded to form a PIG with members Jeanne Lum, Calvin Hara, and Pamela Chow. The motion was adopted by Unanimous Consent, 7-0-0. (AYE: Hagadone, Hara, Moniz, Schneider, Yamada, Kang, and Evans; NAY: None; ABSTAIN: None). Three Absences of Mark Hagadone - No action was taken. 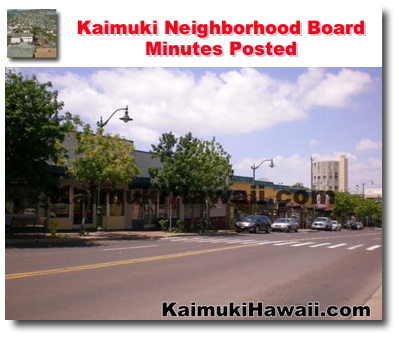 Board Participation in the Kaimuki Business and Professional Association Christmas Parade - Yamada moved and Hagadone seconded that the Kaimuki Neighborhood Board No. 4 participate in the parade. The motion was adopted by Unanimous Consent, 7-0-0. (AYE: Hagadone, Hara, Moniz, Schneider, Yamada, Kang, and Evans; NAY: None; ABSTAIN: None). Approval of Wednesday, September 19, 2018 Regular Meeting Minutes - As there were no objections, the Wednesday, October 17, 2018, regular meeting minutes were approved as amended by Unanimous Consent, 7-0-0. (AYE: Hagadone, Hara, Moniz, Schneider, Yamada, Kang, and Evans; NAY: None; ABSTAIN: None). A. The Kaimuki Business and Professional Association Christmas Parade is on Thursday, December 6, 2018, 6:00 p.m. at Chaminade University/St. Louis High School, ending at Kokohead Avenue. B. Support Kaimuki's small businesses on Small Business Saturday, November 24, 2018, the Saturday after Thanksgiving. C. The next regular Board Meeting will be on Wednesday, January 16, 2019, at Kaimuki Christian Church, Fellowship Hall, 7:00 p.m.
ADJOURNMENT - Chair Schneider adjourned the meeting at 9:02 p.m.